A federal judge declined to stop construction of the disputed Dakota Access oil pipeline, clearing the way for oil to flow as soon as next week. BISMARCK: A federal judge declined Tuesday to temporarily stop construction of the final section of the disputed Dakota Access oil pipeline, clearing the way for oil to flow as soon as next week. The tribes argued that construction under the lake violates their right to practice their religion, which relies on clean water, and they wanted the work suspended until the claim could be resolved. When they filed the lawsuit last summer, the tribes argued that the pipeline threatens Native American cultural sites and their water supply. Their religion argument was new, however, and disputed by both the Corps and the company. Boasberg in his ruling Tuesday said the tribes didn't raise the religion argument in a timely fashion. "Only once Dakota Access had built up to the water's edge and the Corps had granted the easement (for drilling) to proceed did Cheyenne River inform defendants that the pipeline was the realization of a long-held prophecy about a Black Snake and that the mere presence of oil in the pipeline under the lakebed would interfere with tribe's members' ability to engage in important religious practices," the judge said. Boasberg said he is likely to allow the tribes to continue making the religion argument, though he doesn't think it's likely to succeed. 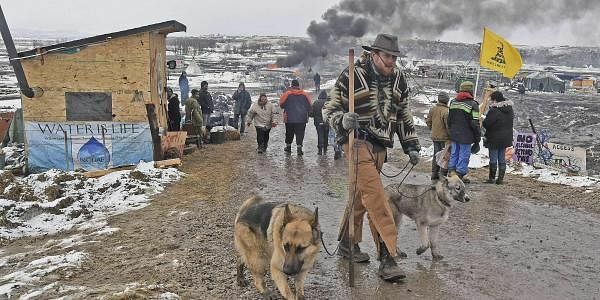 "Although the tribe's members may feel unable to use the water from Lake Oahe in their religious ceremonies once the pipeline is operational, there is no specific ban on their religious exercise," he said.